Garrett brings seven years of leadership in issues of peace and conflict in central and east Africa to BFC. His experience includes research, advocacy, civic engagement, sustainable development, and peacebuilding activities in DR Congo, Uganda, and the wider Great Lakes Region. His activities with international human rights groups and regional civil society strengthen the appropriateness and effectiveness of BFC actions for peace and stability in the Congo. 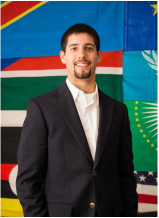 Garrett currently sits on the Board of Directors for the community based organization GLOFORD Uganda and is a remote researcher for the Enough Project. Garrett graduated from Boston University in 2015 with a major in biomedical engineering and studies in international relations. He currently resides in North Andover, Massachusetts and can be reached at gmoore(at)bu.edu. For 3 years now, Gina advocates for the campaign against conflict minerals from the Eastern region of the Democratic Republic of Congo. She researched the ongoing conflict extensively and produced analytic reports and promotional material to raise awareness. Gina is the Northeast Campus Organizer for the Enough Project's Conflict-Free Campus Initiative which recruits student leaders to bring campus wide policy change for peace in the Congo. She also works closely with activist groups - like Congo Action Now - and local Congolese communities with whom she lobbies at the Massachusetts State House to educate legislators on conflict mineral legislation. Gina graduated from Brandeis University with a B.A. in English, Political Science, and Legal Studies. She can be reached at ginagkoul@gmail.com. Stella is a legal studies major with a minor in Human rights from Lasell College. She is currently, the president of Lasell for Congo, a campus activist organization that has been working closely with Congo Action Now and the Enough Project to raise awareness and join the conflict-free campus movement. Stella has been collaborating with local activist coalitions for a year and she's now excited to intern for BFC as an advocate. Stella also has been a member of the Lasell Volleyball team for the last 3 years!